Brett Gaylor stories at Techdirt. 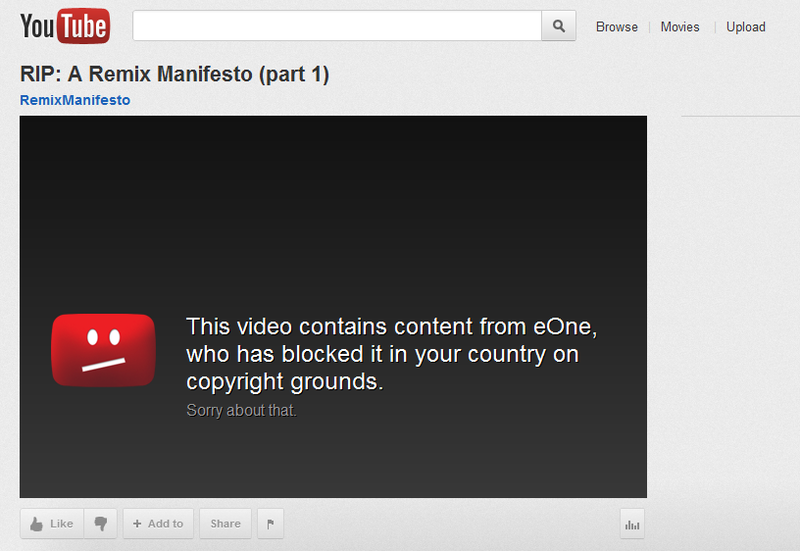 stories filed under: "brett gaylor"
RiP: A Remix Manifesto... Taken Offline Due To Copyright Claim? A few years ago, we wrote about the ridiculous hoops filmmaker Brett Gaylor had to jump through in making his film, RiP: A remix manifesto. If you haven't seen it, you should. As you might imagine, it's a movie all about culture and remixing, focusing quite a bit on the artist Girl Talk, but also featuring a number of other folks you probably know, including Cory Doctorow and Larry Lessig. Here's the trailer: It's absolutely worth watching. Hell, if you've got an hour and a half to kill, you can watch it right here (via Vimeo): The full video is also available on Hulu and a number of other places -- including off of Brett Gaylor's own website, where you can pay what you want for it. Whether or not you think this music is original isn't the point. Because the rules of this game don't depend on who made the songs. They depend on who owns the copyright. And according to the people who do, sampling even a single note is grounds for a lawsuit. That means these kids should not be dancing. And you shouldn't be watching, because using these songs in my movie is against the rules too. And the fact that there are people out there calling my favorite artist a criminal, is exactly why I need to make this film. To be honest, I have no clue how long that clip has been down, but it does strike me as quite ironic. As far as I know neither Gaylor nor Gregg Gillis (who is Girl Talk) has been sued for infringement. And even though the movie (and Girl Talk's music) are widely available all over the place...apparently eOne decided that it couldn't have that on YouTube.